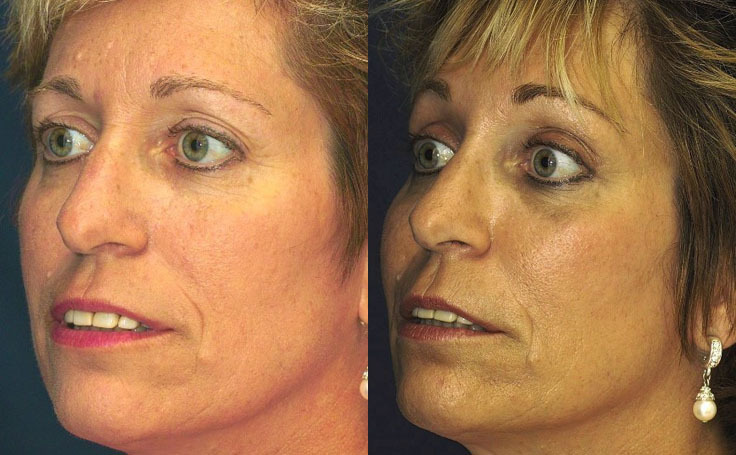 This patient underwent had Fat Transfer to her cheeks, and Liposuction to the lower face. Thus fat was added into areas of the face which needed volume, and fat was removed from the lower face to show more definition of the jawline. Notice how the Fat Injections filled out her cheeks and gave her face a more healthy, youthful appearance. The procedure was performed by Dr. Ricardo Rodriguez in Baltimore, Maryland. Fat grafting to the face is one of the best ways to rejuvenate your face to a more youthful look. For more information see our blog post, Fat Injections to the Face. Patients depicted in our Fat Transfer gallery have provided their written consent to display their photos online. Every patient is unique, and surgical results may vary. Please contact us if you have any questions.